Hello sweet Friends!! I am excited today to share some of the progress we’ve made out back! 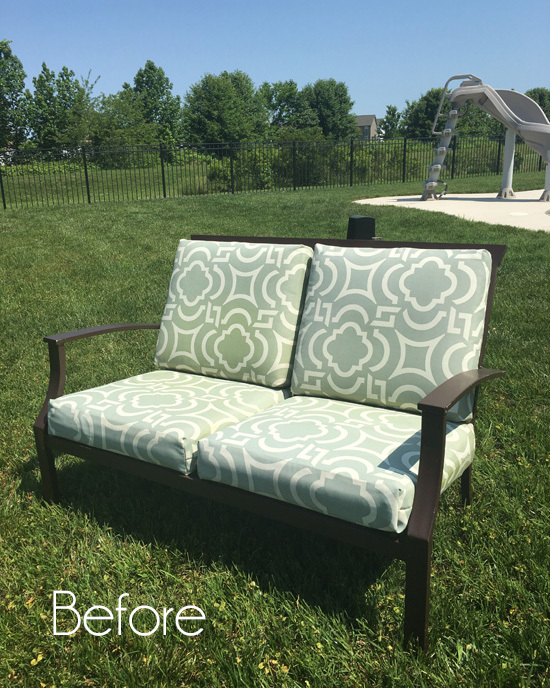 You may remember me mentioning that I still had the loveseat to my outdoor patio set when I shared the two side chairs that went with it in this post. 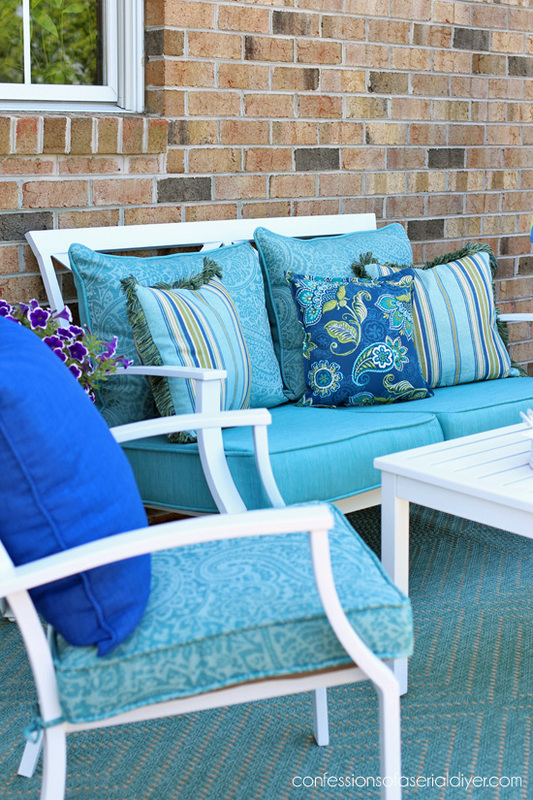 I redid those for our side porch and was debating whether or not to redo the loveseat to go along with them out there. However the truth is, we rarely sit out on our side porch, so I hated to waste it out there when we really needed seating for our deck in the back. I broke down and bought a new dining set (That was SO hard for me!) 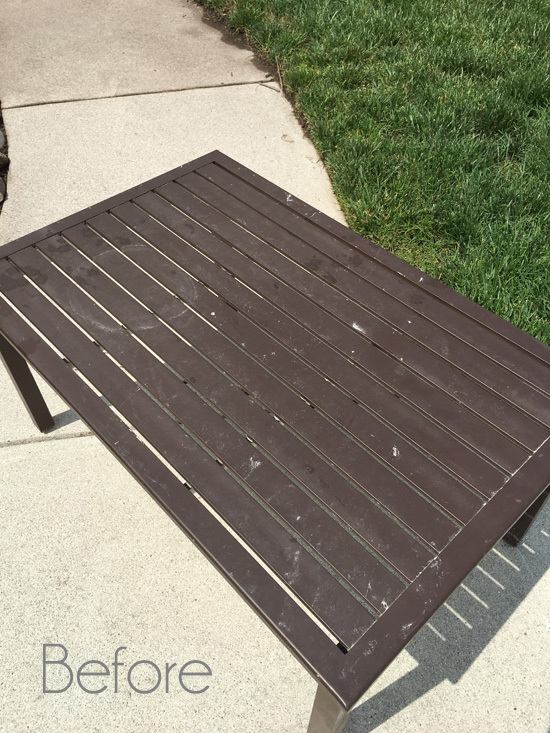 when the table to this one kicked the bucket, and I was just going to put these chairs on the curb, but I just couldn’t bring myself to let them go. 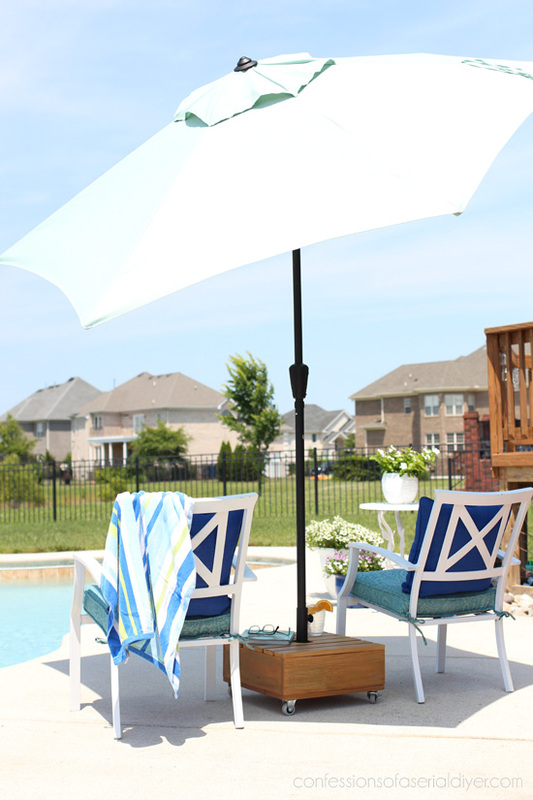 A couple of weeks later it occurred to me that I could use two of them down by the pool so I would have a place to sit and watch the kids swim. Yes those are the same chairs! I can’t tell you how happy I am that I did not put them on the curb!! I was super pleased with myself for this one! 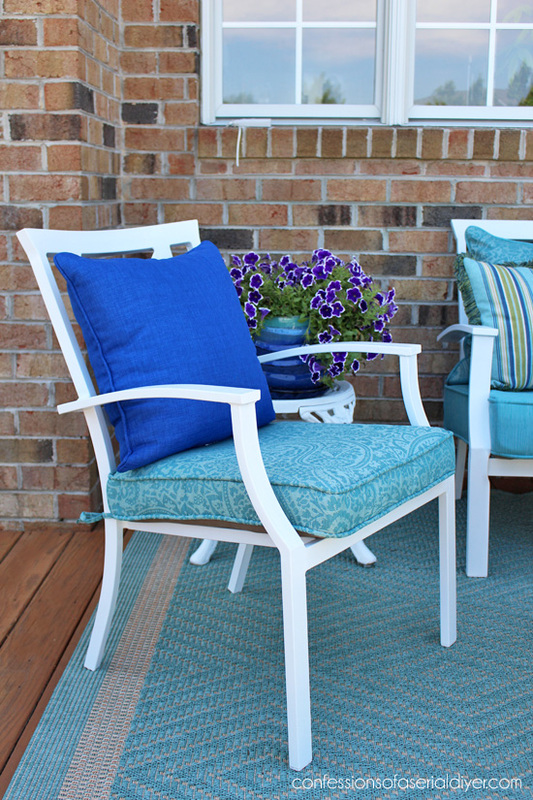 THEN it occurred to me that I could pair the remaining two dining chairs with the loveseat to make a set for the deck! 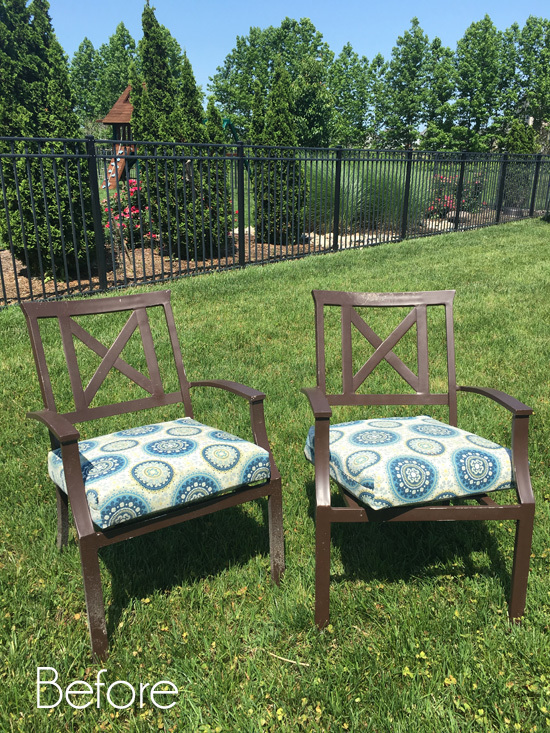 The side chairs that originally went with this loveseat (that ended up on the side porch) were much larger than these, but I think these work great! This is kind of a narrow deck space and I don’t think the larger chairs would have fit as well anyway. It is amazing what a can of spray paint can do! To update these pieces, I washed them down with my hose and a sponge first and let them dry in the sun. 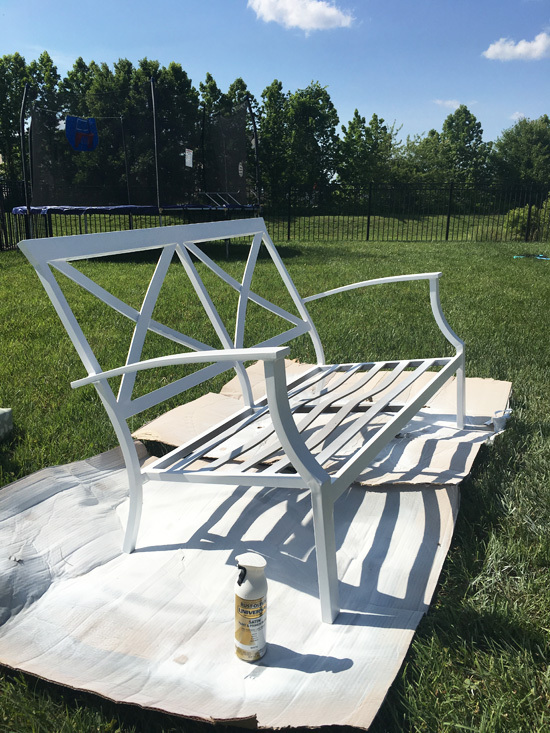 Then I gave each piece a coat of Rustoleum spray primer to help cover the dark brown more easily. I was pleasantly surprised how fantastic they looked! 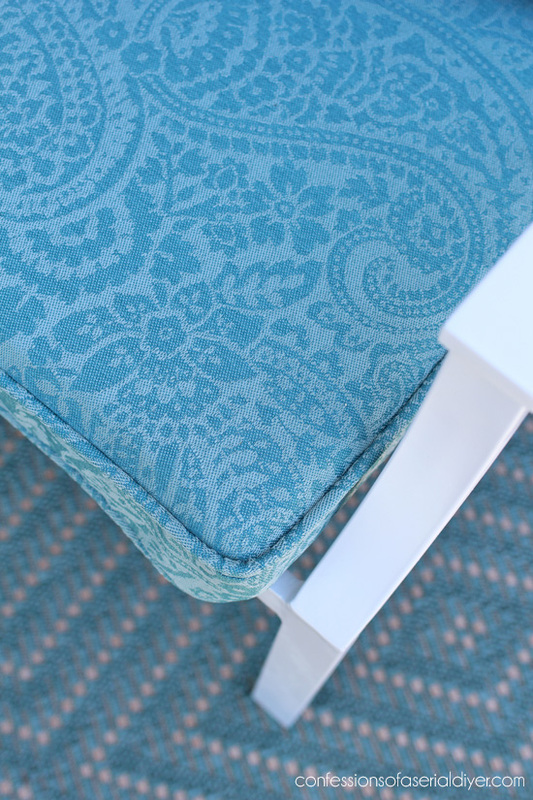 I had planned to sew new covers for the existing cushions like I always do using my Sew Easy Outdoor Cushion Cover Tutorial, but I just could not find a fabric that I wanted to use. This spot is nice and shady until the afternoon, which is a bit of a challenge to photograph, but makes for the perfect spot to sit in the mornings. This set has come full circle. It was white when I bought it. I wasn’t sure how it would do going back to white from dark brown, but it did great! I wasn’t sure anyone would be interested in seeing a deck staining post, but I did take pictures along the way just in case anyone was interested in seeing the process. Let me know in the comments if that is something ya’ll would like to see. Once again I’ll be joining in the Seasonal Simplicity Summer Series hosted by my sweet friend Krista from The Happy Housie. 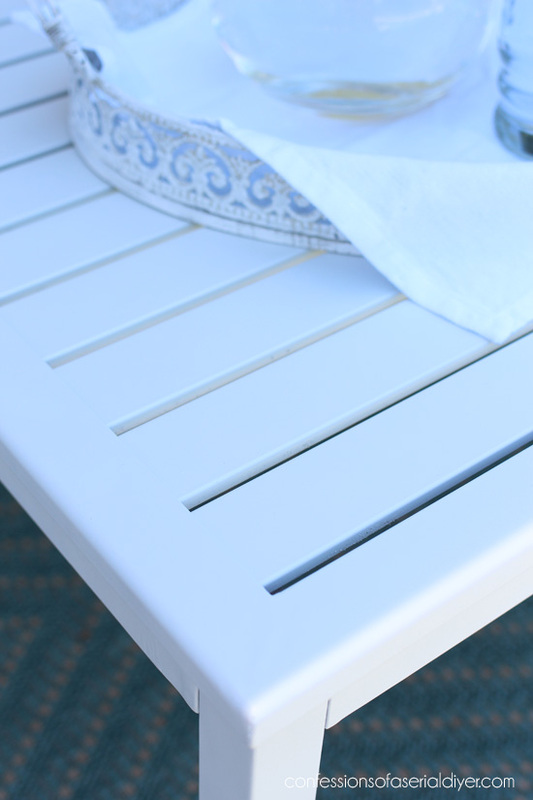 We are sharing outdoor spaces, so I’ll be back sharing the rest of our deck, and my new dining set! I just shared the more narrow space in the foreground. The coffee table is in about the same place for reference. 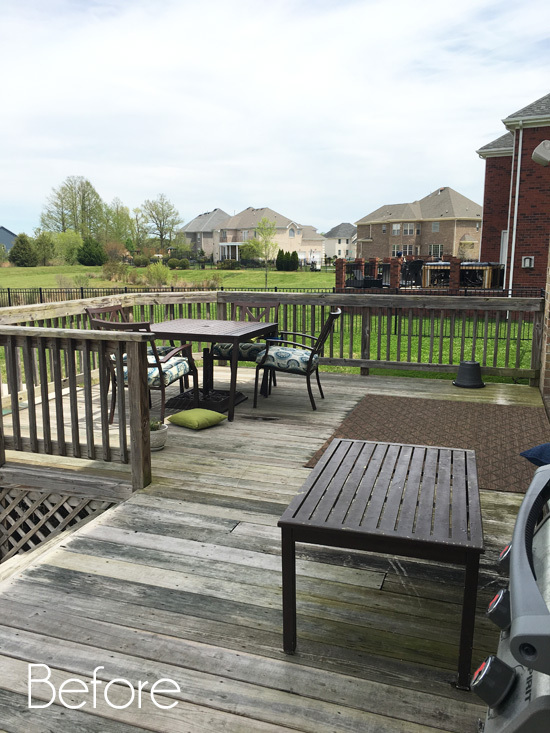 UPDATE: No need to come back, see what this side of our deck looks like now HERE! Wow that is really cute. Yes I want to see the deck staining. My husband and I are working on my old deck, and we are replacing wood floor and rails as they are almost rotten. I have to stain the new deck once we get it back together and I have never stained a deck and need help with what stain to use and how. I love how your furniture came out, its all so beautiful. Looking forward to your post tomorrow. 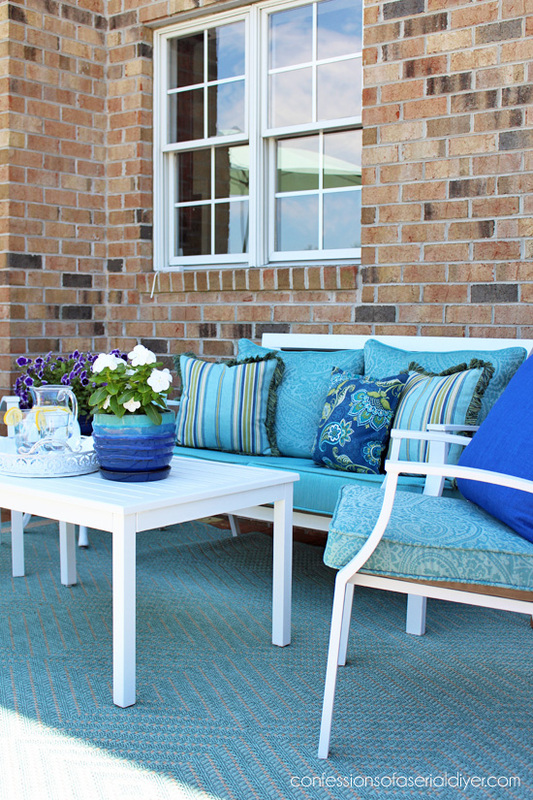 Wow Christy what a gorgeous re love of this patio set. I love the blue colors so pretty. Christy, wow!!! You go girl, this set looks so bright and cheerful! 🙂 Some wonderful finds with the cushions and pillows. Once more, you have done a beautiful job making your space look amazing! And the deck… wow, that also had to be a huge job! Enjoy!! Absolutely beautiful! 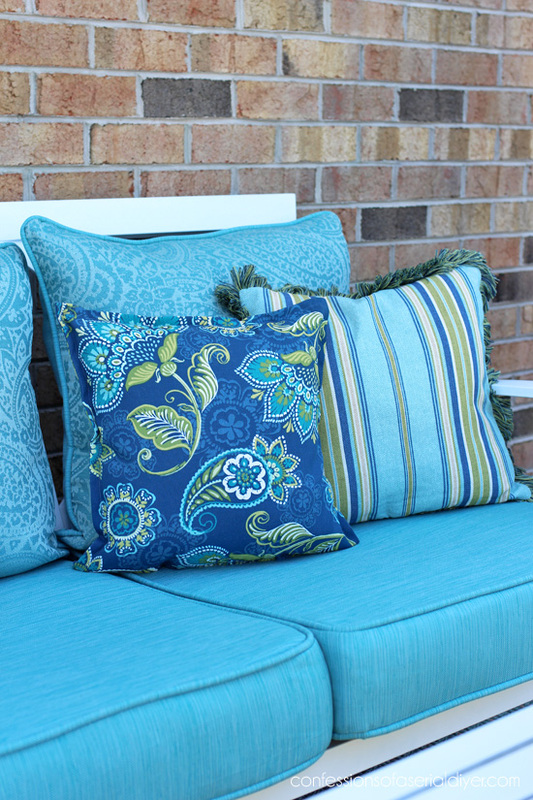 I love all the blue materials you used for the cushions. Thanks for sharing! 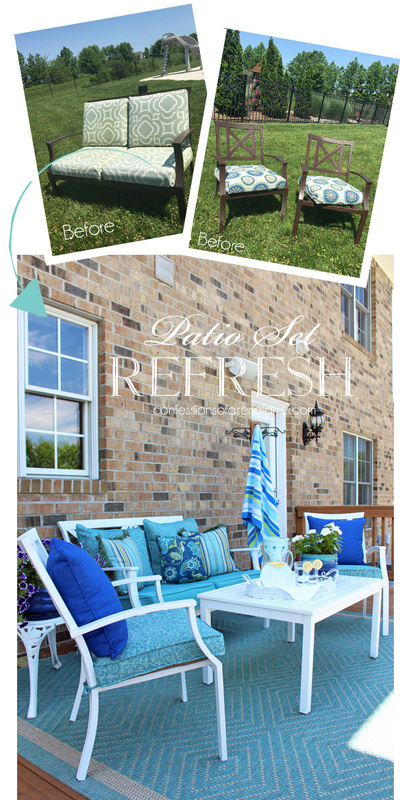 nice redo – lots of work! and yah, do show process of restaining please. I always wonder if a rug on wood decking is hard on it because it holds the moisture against the wood? I would love to see a post on redoing deck! 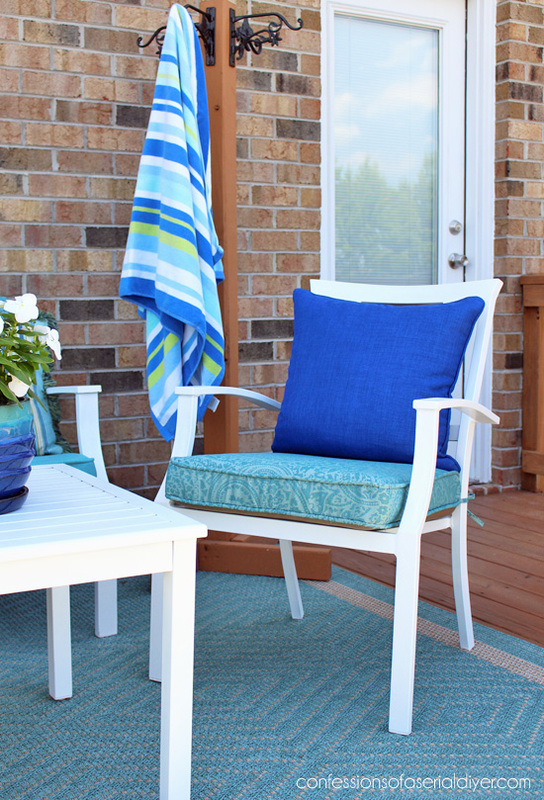 Color and brand of the deck stain that you used? Hi Jo! I used Thompson’s Water Seal in Desert Brown, semitransparent. Good morning! 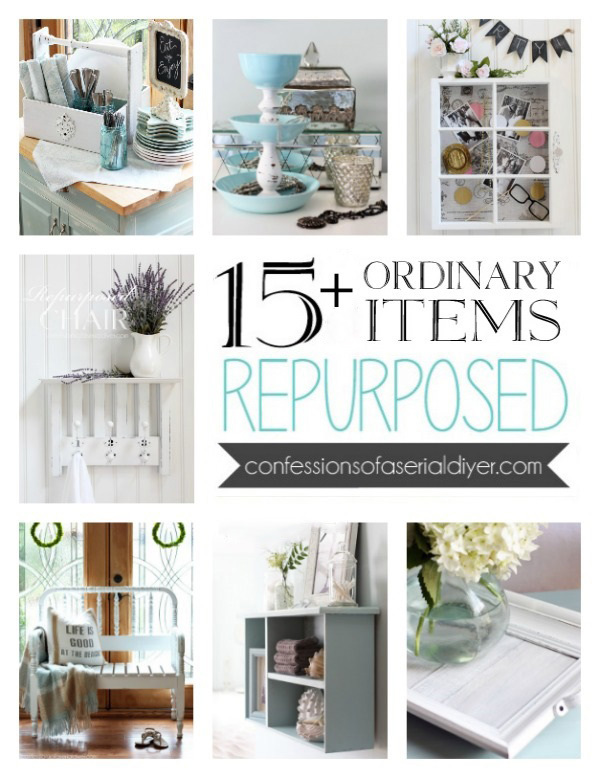 Gorgeous job – I love a good refresh! 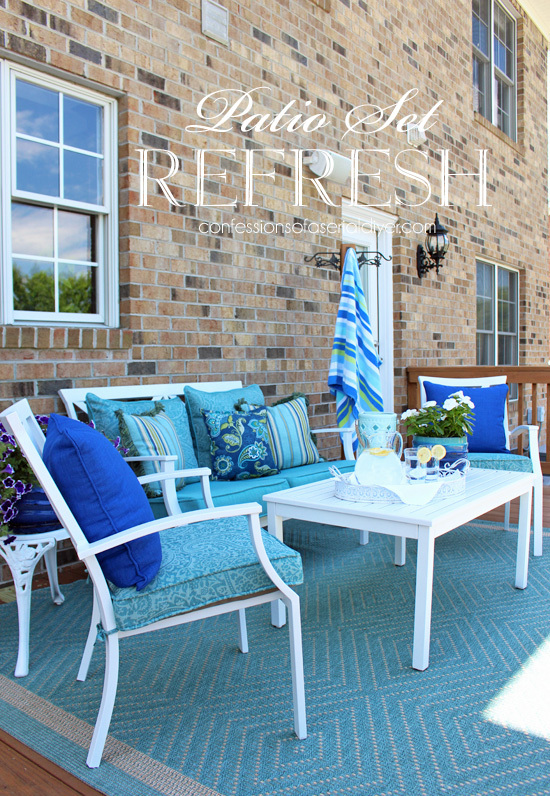 And yes, I would love to see a post of the process you went through to refresh your deck! Thank you so much. I look forward to seeing your renovations every Tuesday & Thursday !! 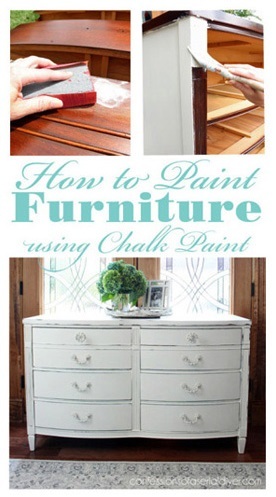 You explain everything so clearly & in a fun way – I painted 2 of the pieces in my den from drab brown to light cream color. What a wonderful difference !! And it’s all to you – you have me the push to try it & I love it !! 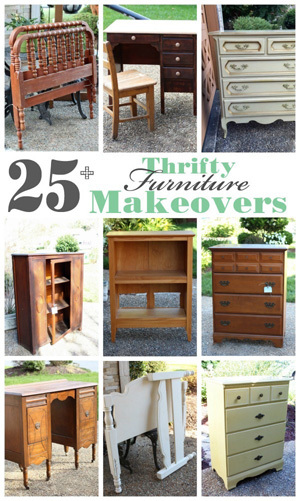 Now to tackle the 3 large furniture pieces in my den……. Thanks!! It really looks nice, and the white really freshens everything up. The deck looks new too! You always do such a great job with each of your projects. Oops! Quick question: where/how do you store your cushions on rainy days and off season? Or do I just resign myself to either recovering or buying new each year? I am really bad about that…I usually just leave them out. When I recover them myself, I know I can turn them all over next year and they’ll look new again. Then I’m ready for a switch up the following year. But because I spent a good penny on my new cushions this time, I will probably bag them up at the end of the season and store them in the attic. As for rain, these new ones from Lowes are somewhat water repellent and dry out really quickly and I love that. So fresh and inviting, Christy! Isn’t it funny how everything came back around to the original white? When it was dark, it looked like it always was that way. Now, it looks like it always was white. Gotta love spray paint! 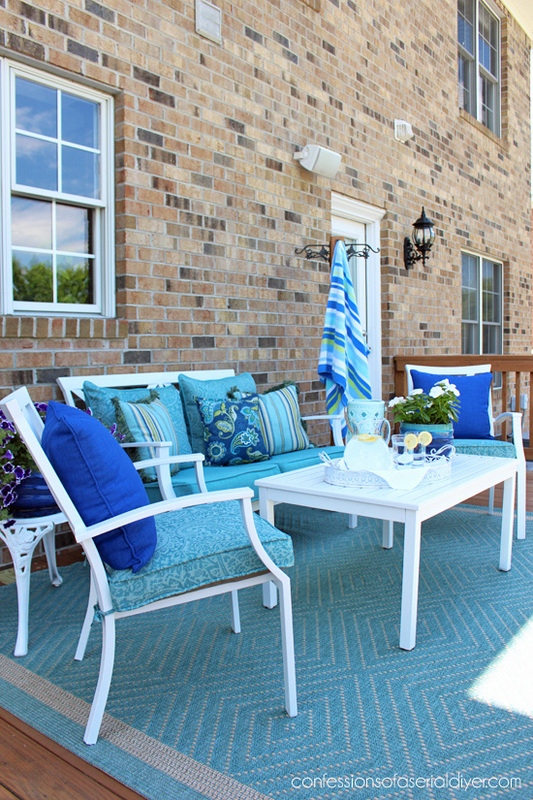 The blue rug set the tone for this lovely sitting area. 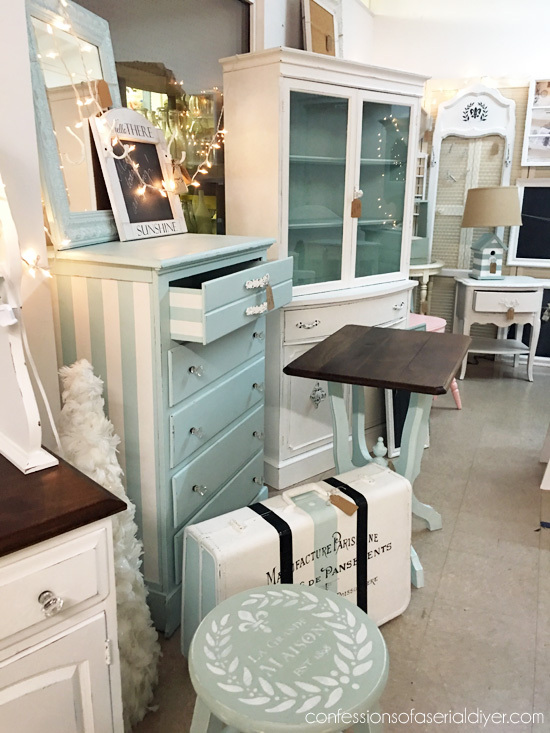 I have to say that I was so taken by the umbrella stand that I didn’t even notice the chairs earlier 😳 (I did notice that you didn’t make the cushions in this post! You did deserve a break – remember your time is valuable, too.) Your family is going to enjoy this space for a long time. Another beautiful project. I love the white, it looks so crisp & clean. I just love all your work. Great job, Christy!! I would LOVE to see the process of the deck staining. It looks so nice! I would actually love to see your deck staining post. I need to redo my front porch. It all turned out so pretty. 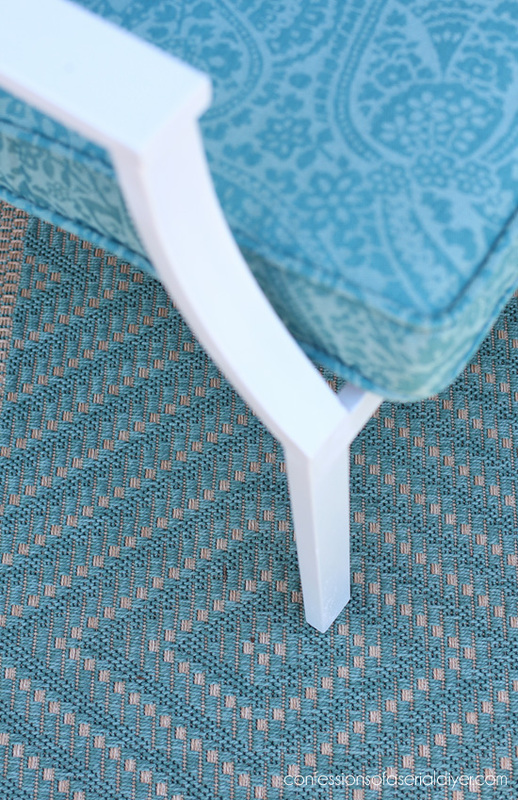 Love the mix of fabrics together. You always amaze me with your never ending talents. I have been following you for a few years. You rock. Awesome! You are so clever! Love your backyard!!!! Wow! It looks like a brand new coordinating set! Paint is amazing!! You amaze me! Just lovely as usual. 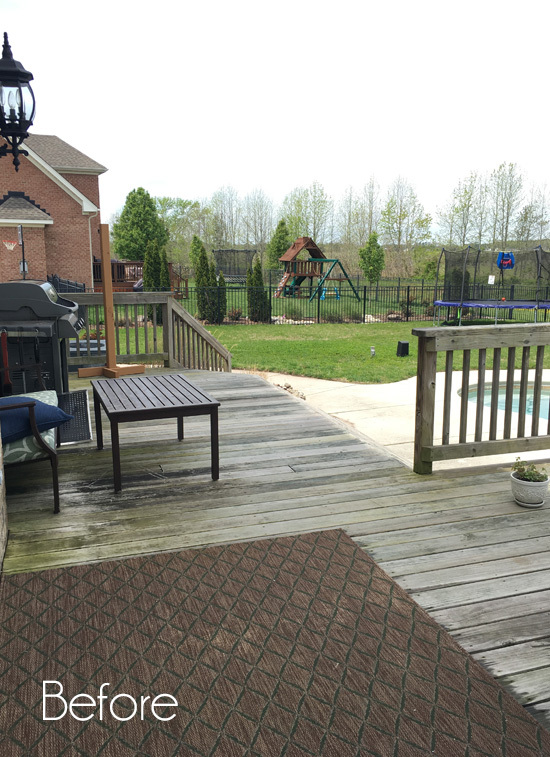 I have a dying deck too so would love to know how to stain and what to use. Looks amazing, love the colors. I second that Rustoleum paint. I’ve redone some patio furniture with it and it’s amazing. 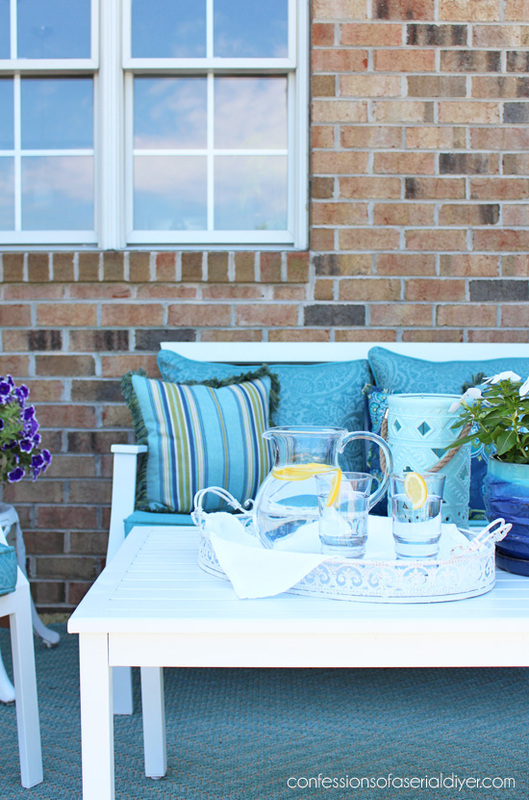 I love your outdoor furniture! It looks fabulous! I especially liked your outdoor rug. I’m looking to get one for my patio. Do you know if they had it in brown or tan? I used to have blue and white, but not too long ago I got a swing for Mother’s Day and it is brown, tan and cinnamon. Since my umbrella for my table had some holes in it and needed to be replaced I thought I would stay the new color combo. 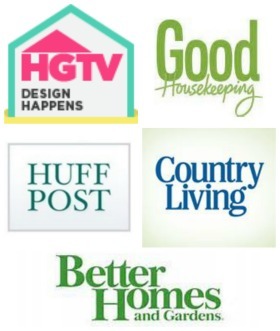 FYI, I mentioned your corbel bookends in my blog today. Found something similar for myself. Wow, the whole set turned out gorgeous. So fresh and bright! I’m so impressed about the refresh on the chairs but it worries me too, lol. Question: Do you leave them outside? Does the wood turn, peel, or rot? I have a lot of wooden pieces that I could use outside but I know they won’t stand up to the relentless heat and rain that we have here in Georgia. Any advice on this that you can share with me? Happy Friday! Wow! What a fabulous outcome! So cheerful and refreshing. 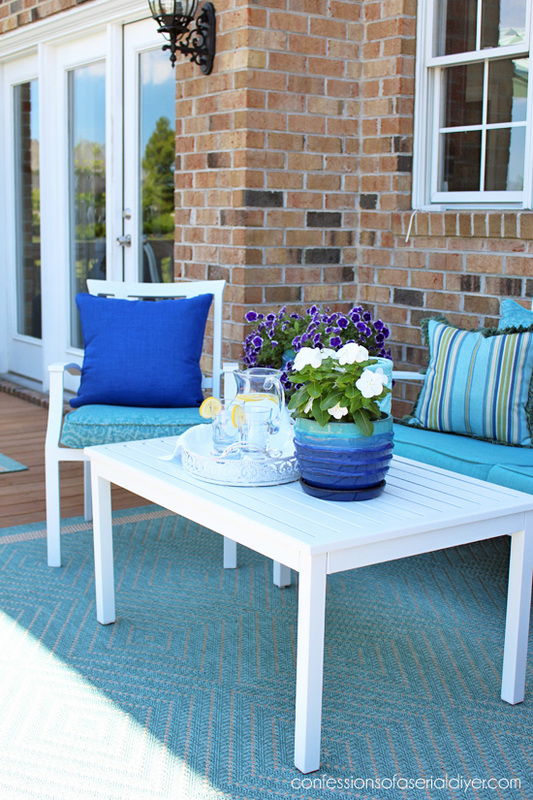 Do you remember where and name/style of outdoor rug and the furniture pieces? Thanks for the inspiration!